You are here: Home / Projects & Resources / Environment / Global Warming / Myths vs. Facts: Global Warming / 31,000 scientists say "no convincing evidence". While polls of scientists actively working in the filed of climate science indicate strong general agreement that Earth is warming and human activity is a significant factor, 31,000 scientists say there is "no convincing evidence" that humans can or will cause "catastrophic" heating of the atmosphere. 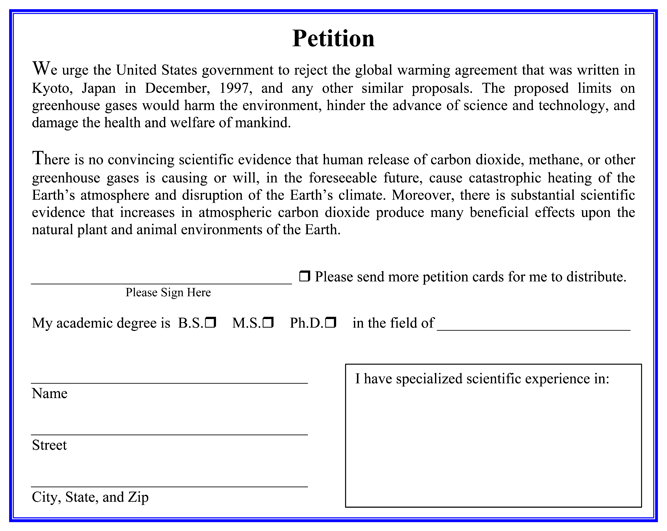 To participate in the petition one only needs to mark a check box to show that one has a Ph.D., M.S., or B.S. degree, and then fill in the fields. Unfortunately, that means that anyone can sign the petition, whether they have a degree or not. Since the results are not verifiable, there is no way to know how many signers have actually earned a degree. Do '31,000 scientists say global warming is not real'? Maybe. But more importantly what is the significance of these signatures? The majority of signatures are engineers (10,102). 3,046 are in medicine. 2,965 are in biology, biochemistry and agriculture. 4,822 in chemistry and chemical engineering. Without formal training in climate science the level of understanding remains unknown among those that signed the petition. A key question is not how many of those that signed the petition know climate exists, but rather how many of those that signed work directly in the field of climate science. According to the data on the petition site, only 12% of those who signed the petition are indicated to have affiliation with atmosphere, earth, and environmental science. But there is no indication how many work in the field of climate science? WHAT DO SCIENTISTS REALLY THINK? What is notable is that the polls indicate there is a perspective difference between working climate scientists and scientists not working in the field of climate. When one examines the experts in the field, one sees a significant divergence from the general view. So the more important question for us is, what do 'expert' climate scientists think? 82% answered 'yes' to question 2. 84% of scientists say the earth is warming because of human activity. Asked if they regarded global warming as a very serious problem? Scientists agree that humans cause global warming? 97% of the climate scientists surveyed believe “global average temperatures have increased” during the past century. 84% percent say they personally believe human-induced warming is occurring. 74% agree that “currently available scientific evidence” substantiates its occurrence. 5% believe that that human activity does not contribute to greenhouse warming; the rest are unsure. In 1991 the Gallup organization conducted a telephone survey on global climate change among 400 scientists drawn from membership lists of the American Meteorological Association and the American Geophysical Union. In 1991 only 60% of climate scientists believed that average global temperatures were up, compared to 97% today. In 1991 only a minority (41%) of climate scientists agreed that then-current scientific evidence “substantiates the occurrence of human-induced warming,” compared to three out of four (74%) today.